hearth/myth: Results of the great date experiment. 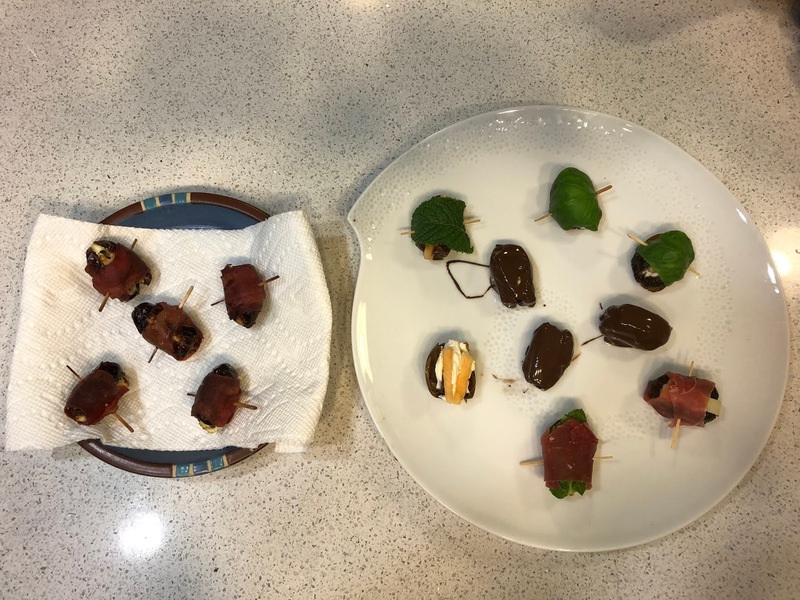 Results of the great date experiment. The ingredients (except for the squash, which I didn't use). As you may recall from our last exciting episode, I had just received 12 oz. of fresh dates and asked for recipes to use them up. I'd forgotten how many foodies I am friends with on Facebook. 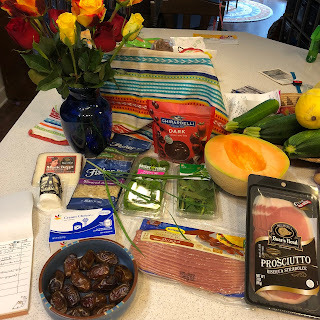 I received a ton of ideas, some involving equipment I don't own (a high-speed blender) and foods I'd never heard of (Lebanon bologna, which it turns out is sort of like salami). And then I forgot about the project until this morning. In the meantime, I'd eaten some of the dates by themselves (which a few people suggested -- good call!). I ended up with just 14 dates -- not nearly enough to make date squares or a walnut-date cheesecake crust. So I narrowed the project to just date-based appetizers. Then I bought the ingredients you see here and began to combine them in logical ways. Or ways that seemed logical to me, anyway. I surrendered to the bacon-wrapped brigade and set aside five dates for hot appetizers; another three were set aside to be enrobed in chocolate (sans rum bath, sadly, as I'd run out of time). That left six dates for room-temperature treats. I steeled myself as I de-pitted each date, knowing that if I ate any now, I'd have even fewer for the test. Then I set to work. And then, when they were done, I ate them all -- in the spirit of science, you understand. Cream cheese, fresh chive, walnut quarter and bacon: 4. Too much going on here, I think. Manchego and bacon: 8. I loves me some Manchego, and it melted better than I thought it would. Goat cheese, slivered almond and bacon: 5. Couldn't taste the almond. Goat cheese and bacon: 7. I would make this again. And in the center: goat cheese, fresh basil and prosciutto: 9. The fresh basil made it stand out for me. Prosciutto is ham cured to within an inch of its life and sliced paper thin. Technically, you don't have to cook it, but it sure didn't hurt. Cantaloupe and fresh mint: 10. Using fresh herbs makes all the difference. Next time I might put the mint leaf inside with the cantaloupe, instead of pinning it across the top. Goat cheese, fresh basil and slivered almond: 8. Cream cheese, walnut quarter and fresh basil: 9. Manchego, fresh chive and prosciutto: 6. The fresh chives just didn't do it for me, and the Manchego is clearly better warm and melty. Goat cheese, fresh mint and prosciutto: 7. Again, the mint makes it. I think I prefer the prosciutto baked, although this was pretty good. Cream cheese and cantaloupe: 9. On the sweet side, but quite tasty. In the middle are the three dates dipped in dark chocolate. I'd give the plain chocolate-dipped dates an 8; I found the chocolate upstaged the flavor of the date. However, I'd shoved a fresh mint leaf into one of the dates before the chocolate bath -- that one earned a 10. So there you go -- some variations on the bacon-wrapped-date theme. Anything with a 7 or up would be worth making again, I think. And simpler is better -- one or two ingredients inside the date got the best results. And of course, your mileage may vary. These moments of scientific blogginess have been brought to you, as a public service, by Lynne Cantwell. In search of date recipes. Transcendence giveaway winners! And some news.